Wales is well known for its natural beauty. The valleys full of song with lakes, mountains and tranquil streams are the stereotype that is what Wales is for so many. Coal mines, tin mines and railways all form part of the image of Wales. The combination of all of these makes for a very unusual and unique attraction in Snowdonia, Hero Xtreme with Go Below, close to Bryn Bella Guest House. Mining has dominated Welsh history and going underground has always fascinated mankind. The Welsh mountains have been a source of income for local communities for hundreds of years and Go Below has created another source of income by going underground for a completely different and somewhat crazy reason. Go Below has nothing to do with mining but it is one of the most exciting underground tourist attractions in Europe, perfect for those who want a little bit of adventure and excitement. 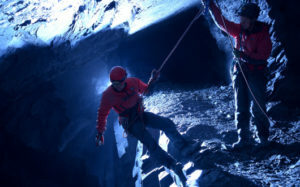 Go-Below defines what they offer as “The Ultimate Underground Adventure” doing things inside a mountain that one would assume can only be done on the outside of a mountain. Go-Below is the adventure everyone who wants to push himself or herself to the limit of enjoyment and physical ability has been waiting for. Go-Below a fun day out but don’t expect it to be a walk in the park, if you want a walk in the park head above ground and enjoy a stroll. Just what is Go Below? Go Below takes visitors on a hectic tour of an unused mine, left exactly as it was the day the last miner arrived back on the surface. A series of tunnels and caves explored on foot, using ropes to conquer gorges and ravines buried deep underground, Go-Below is not for the faint-hearted nor those who are out of shape. Rowing a dinghy along underground lagoons and then traversing sheer rock faces to get up and out at the deepest, darkest end is just part of the challenge. 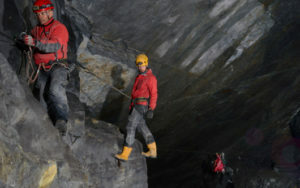 Go-Below is the perfect team building or group fun activity anywhere in the UK. With a choice of “Adventures”, you can put yourself and your team to the test with either the “short” 5-hour challenge that includes abseils, ziplines, ladders and a little bit of rowing, or one of the two full day adventures. The Ultimate Xtreme adventure is for over 18s only and is one of the toughest assault courses anywhere in the world that includes the amazing Goliath Zip and a crazy freefall leap. New for 2017 is equally challenging Hero Xtreme adventure where anyone from the age of 14 can challenge themselves and become an underground superhero. will never do it justice. To make the most of this outstanding attraction you need a hearty breakfast to start your day and a place to rest your weary bones when you are done. 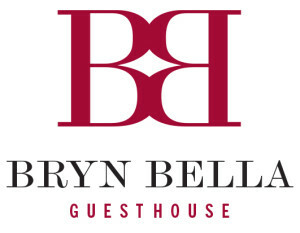 Bryn Bella Guest House is the ultimate place to stay for your Go-Below adventure trip and has all the hallmarks of creating an outstanding weekend for anyone.